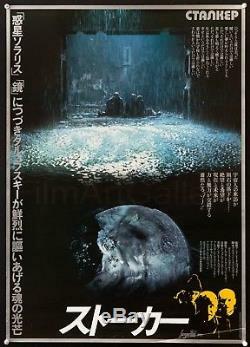 Original release Japanese 1 Panel poster for the classic "Stalker", directed by Andrei Tarkovsky. Note that this film was produced in 1979 in Russia but released in Japan in 1981. Poster measures 20" x 28" inches. Condition is fine, with some minor creasing and edge wear and a diagonal crease at lower right. NOTE: PLEASE IGNORE THE MAGNETS IN THE CORNERS: THEY ARE USED DURING THE PHOTOGRAPHIC PROCESS AND AREN'T PUSHPINS, HOLES OR A DESIGN ELEMENT. PLEASE SEE OUR OTHER ITEMS FOR SALE - LOTS OF COOL POSTERS! It must come back in the same condition as it was sent. FILM/ART has one of the finest collections of original movie posters. The item "STALKER 1981 original Japanese poster Andrei Tarkovsky Tarkovski Film/Artgallery" is in sale since Saturday, July 14, 2018. This item is in the category "Entertainment Memorabilia\Movie Memorabilia\Posters\Originals-International\1980-89". The seller is "filmartgallery" and is located in Los Angeles, California. This item can be shipped worldwide.